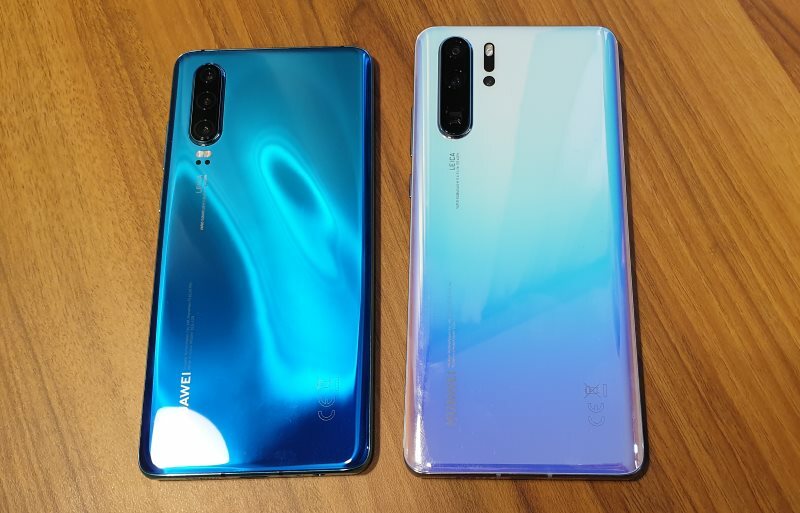 The Huawei P30 (left) is a 6.1-inch device, while the P30 Pro (right) is a 6.47-inch device. However, this time, both devices share very similar hardware specs. Both phones feature an OLED display, FHD+ 2,340 x 1,080 pixels resolution, and 19.5:9 aspect ratio. They also run on the same Kirin 980 chipset, 8GB RAM, and ship with Android 9.0 with EMUI 9.1. The only difference is that the P30 only comes in 128GB, while the P30 Pro will feature 256GB and 512GB variants. Price and availability details here. This time, both the P30 and P30 Pro will feature the same colorway options: Aurora, Breathing Crystal and Black. Seen here is the more metallic Aurora on the smaller P30 and the mirror-like Breathing Crystal on the P30 Pro. The P30 features a 3,650mAh battery with 22.5W SuperCharge, while the P30 Pro features a 4,200mAh battery with 40W SuperCharge. Both phones will support 15W wireless charging and reverse wireless charging capabilities. 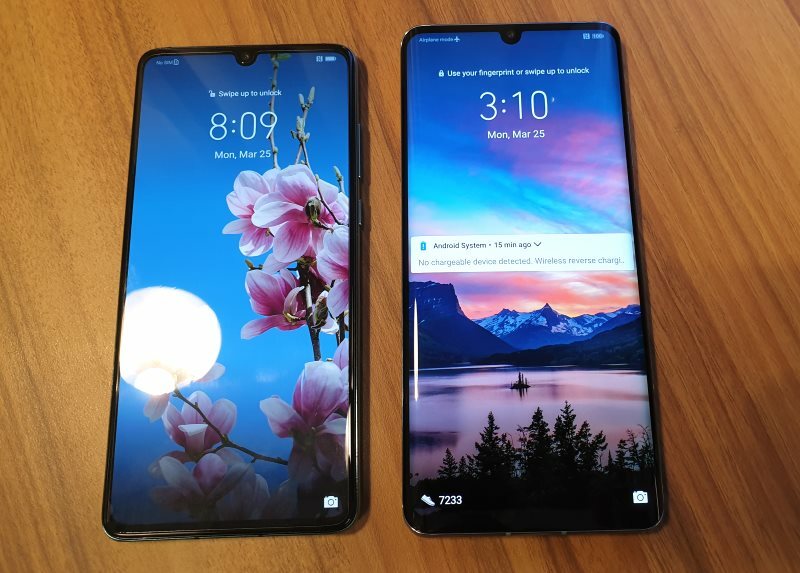 Side view of the P30 (top) and P30 Pro (bottom) shows how much larger the P30 Pro is. 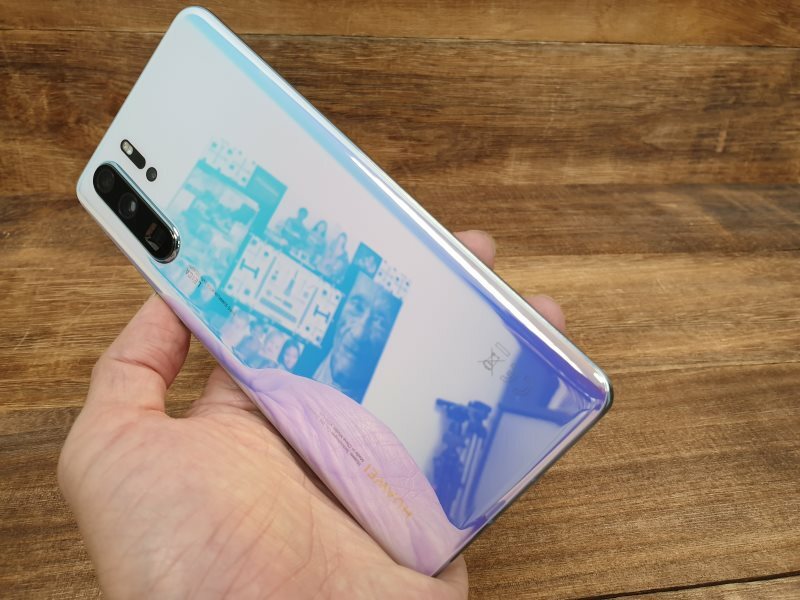 It may be worthwhile to note that while both devices have identical display specs and rear colorway options, only the P30 Pro features a curved glass design. 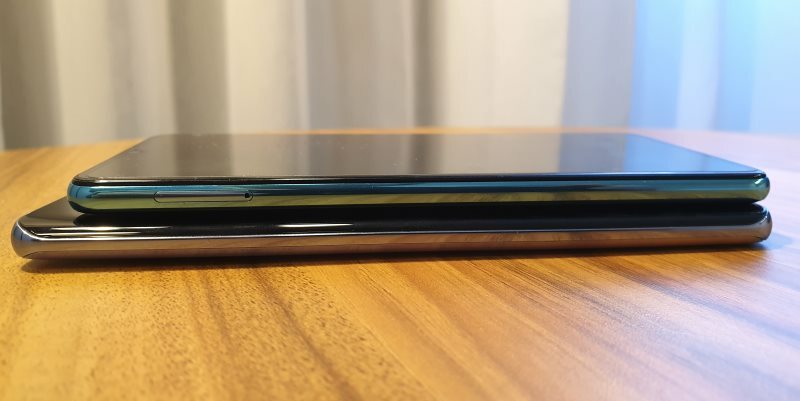 This effectively helps to hide how thick the P30 Pro really is. The P30 is 7.57mm thick and weights 165g, while the P30 Pro is 8.41mm thick and weighs a hefty 192g. 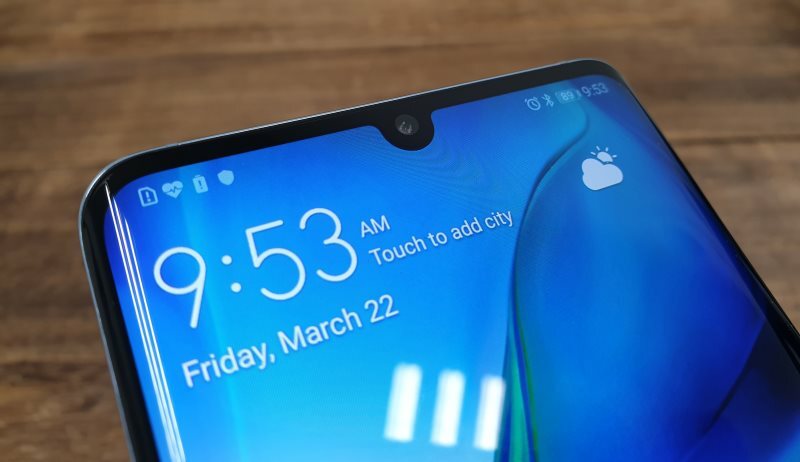 The P30 series continues Huawei's minimalist design approach, and the only physical buttons you'll find on both the P30 and P30 Pro are the volume and power buttons on the right side of the phones. 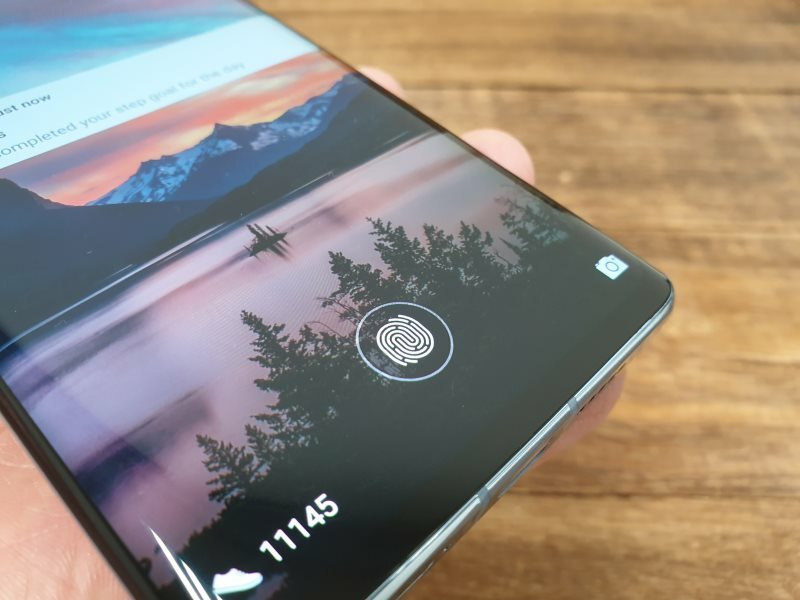 Unlike the differences in the Mate 20 and Mate 20 Pro last year, both P30 and P30 Pro will feature an in-screen fingerprint sensor. This year's models also seem to have the fingerprint sensor in a more sensible, easily accessible location at the bottom of the phone. 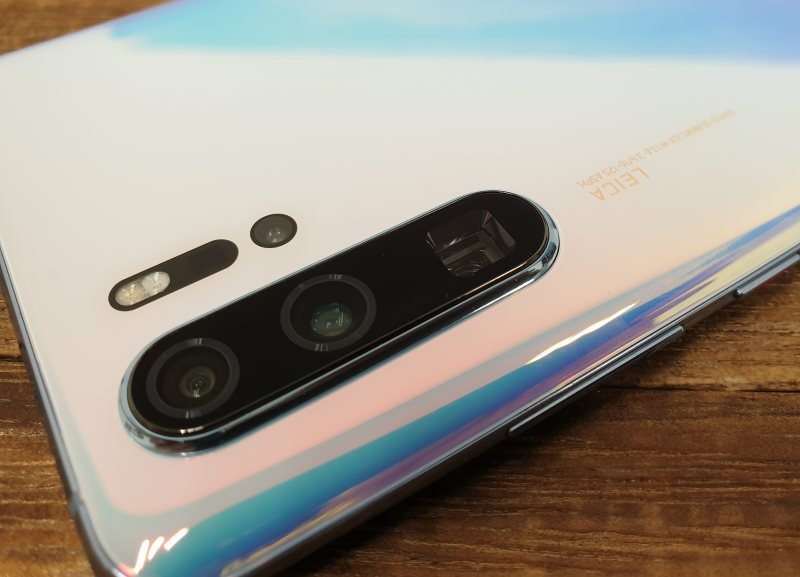 According to Huawei, the in-screen sensor is also newer and more advanced than the one featured in the Mate 20 Pro, now capable of unlocking the phones in just 0.5 seconds. 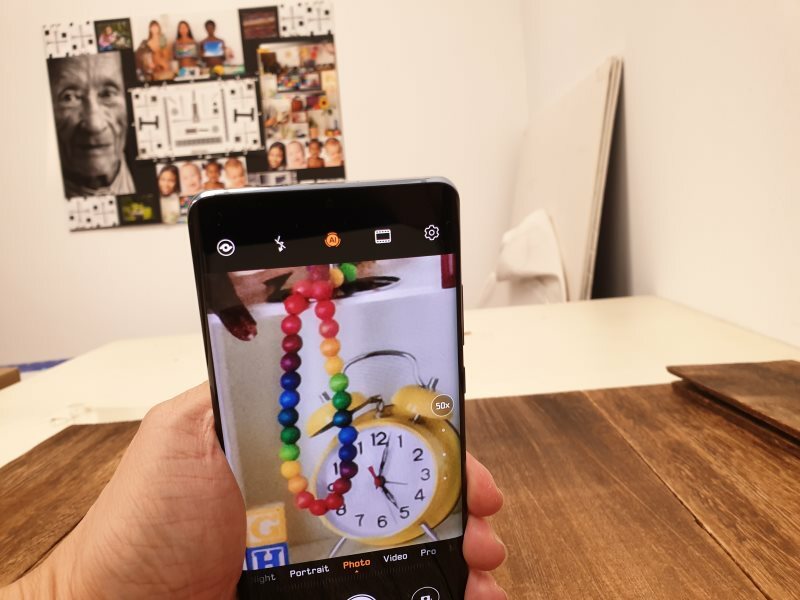 The selfie camera on the P30 Pro has been updated from the 24MP shooter on the P20 Pro to 32-megapixels with HDR capability and an f/2.0 lens. The phone features a small dewdrop display similar to the Mate 20 before. The P30 Pro also boasts of having an "Omnidirectional electromagnetic sound on display system", which basically vibrates the OLED display like a diaphragm to produce sound instead of a traditional speaker. This is why there aren't any speaker grilles on the top face of the phone where your ear would make contact. 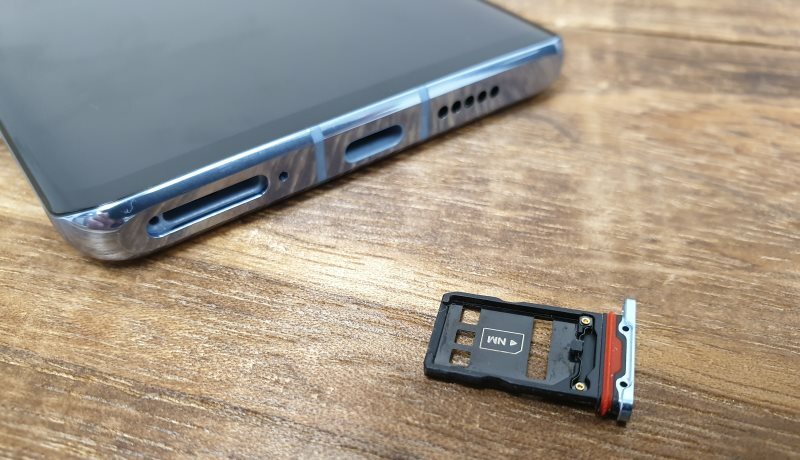 At the bottom of the P30 Pro, you'll find a USB-C port and dual SIM tray, and yes both the P30 and P30 Pro still only support Huawei's proprietary Nano memory card for memory expansion. Do take note that only the P30 Pro is waterproof to IP68; capable of being submerged in water down to 1.5m for up to 30 minutes. The P30 is NOT waterproof. The Breathing Crystal color is another take on the popular blue-purple gradient, which I find quite subtle and light. However, fingerprints and smudges show up on it much faster than the other color options available for the P30 series. On the other hand, it's so shiny, that from afar, you'll only see reflections. 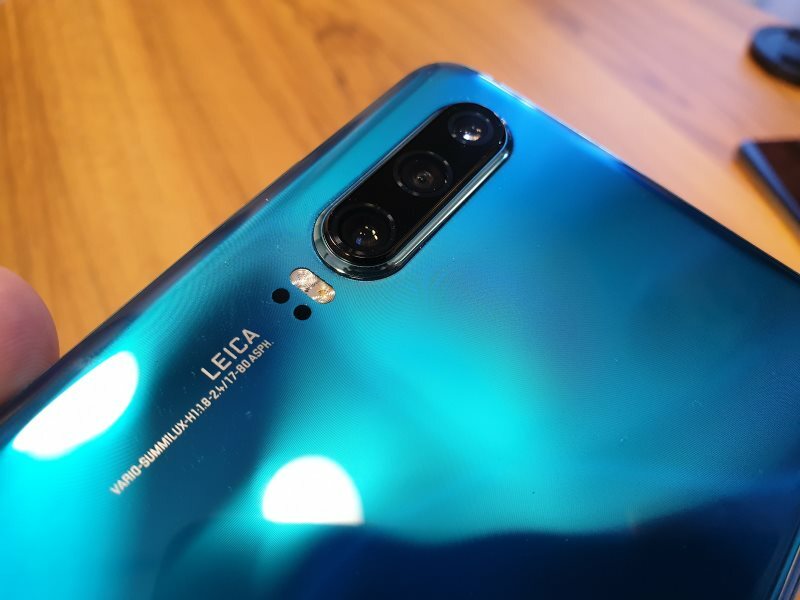 Huawei's first four-camera setup, the P30 Pro has a 40MP f/1.6 main lens with a world's first SuperSpectrum sensor, 20MP f/2.2 ultra wide angle lens, 8MP f/3.4 telephoto lens with a new periscope prism design capable of 5x optical zoom and 10x Hybrid zoom, and a Time-of-Flight (ToF) camera. The SuperSpectrum sensor bucks traditional RGB (Red, Green, Blue) sensor design with RYB (Red, Yellow, Blue). This yellow filter is capable of absorbing both red and blue light to provide more vibrancy, and is also 40% more sensitive. With its new 5x optical zoom periscope lens design, OIS on both 40MP main and 8MP telephoto cameras, plus all the AI and computational photography features introduced since the P20 Pro and Mate 20 Pro, the P30 Pro doesn't just boast of pushing Hybrid zoom up to 10x, but offers up a serviceable digital zoom of up to 50x! Can you even see where this clock is on the chart behind? The P30 comes with the same 32MP f/2.0 front camera and dewdrop design as the larger P30 Pro, so there's no difference in selfie capabilities between the two phones. However, you'll notice that the P30 actually has a speaker grill at the topmost edge of the bezel because it doesn't feature the electromagnetic vibration display sound technology. 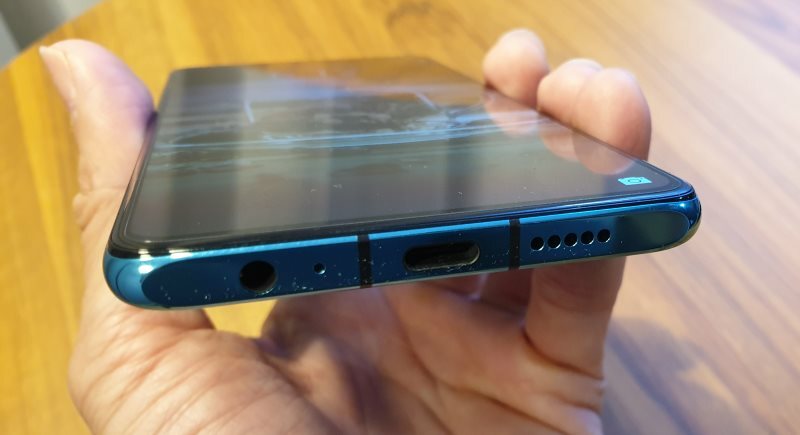 The bottom of the P30 is almost similar to the P30 Pro, with a USB-C port in the middle and speaker grilles on the right. However, it still retains a 3.5mm audio jack, while the P30 Pro does not. Also, as mentioned in a previous slide, the P30 is not insulated or waterproof, so don't take this into the pool or shower. 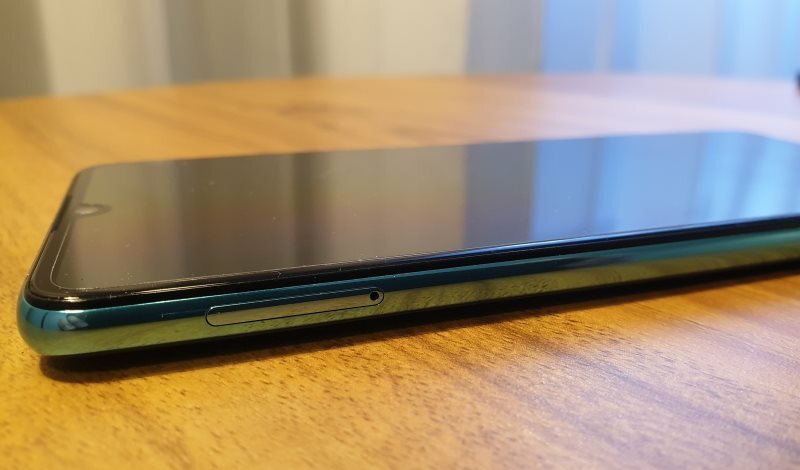 Because the P30 has a headphone jack at the bottom of the phone, the SIM card tray has been moved to the top-left side of the phone. 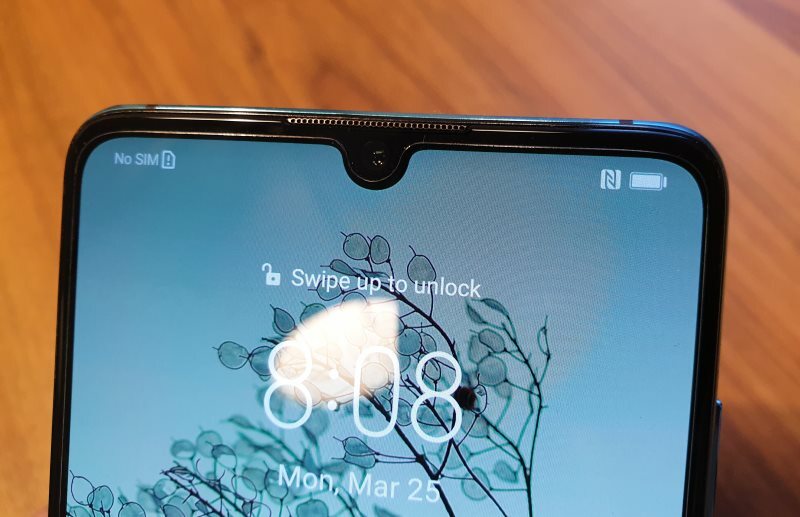 You can see a little more clearly in this photo of the angular, standard flat panel design of the P30, as opposed to the curved glass of the P30 Pro. The P30 isn't as advanced as the P30 Pro, with "only" a triple camera setup, but it's not really that far behind. In the past, with the P20 and Mate 20, Huawei drastically reduced the main camera performance of the non-Pro variants. The P30 actually features the same 40MP SuperSpectrum main sensor just like the P30 Pro, except with a slightly slower f/1.8 lens (identical to that on the Mate 20 Pro). The other two cameras are similar to the Mate 20: a 16MP f/2.2 ultra wide and 8MP f/2.4 telephoto with 3x optical zoom and 5x hybrid zoom. The P30 also boasts 30x digital zoom.